When someone comes to me with an existing engagement ring it often does not suit the desired wedding ring and the issue is compounded further when we get to the eternity ring later. I first met these customers way back in 2012 when they came to me searching for a custom made wedding ring to match the engagement ring that they had purchased at a jewellery chain. Take it back, they did! The diamonds above are not this customers but they are a great example of what we are going to talk about first. They were purchased by another customer elsewhere but all of those flaws and chips were never noticed by her until I pointed them out. Whenever someone brings a piece of jewellery to me to have work done on it I need them to be aware of what they actually own. Often there are characteristics in the piece that they have not noticed. In the case of the engagement ring we are going to look at now the diamond had quite a few issues like those shown above. After pointing them out these customers were unhappy and felt the jewellery chain should have pointed out those flaws. I told them to take it back and discuss it with the jewellery chain they purchased the ring from. They got the diamond replaced with a much better quality one at no extra cost! Kudos to the jewellery chain for fixing this. This customer wanted to have a straight wedding ring. However the base of the main diamond setting protruded to hinder this. In the sketch to the side you can see how the two rings are unable to sit next to each other. Over time those two rings will rub against each other and the base of the setting will wear away. Similar to the ring I wrote about in this 2016 article. When you get more even contact between two rings that sit next to each other you get more even wear. At the time I made the wedding ring the customer decided to live with this issue. The base of the setting turned in. Six years later and my customers have returned to have the third ring in the bridal set made. 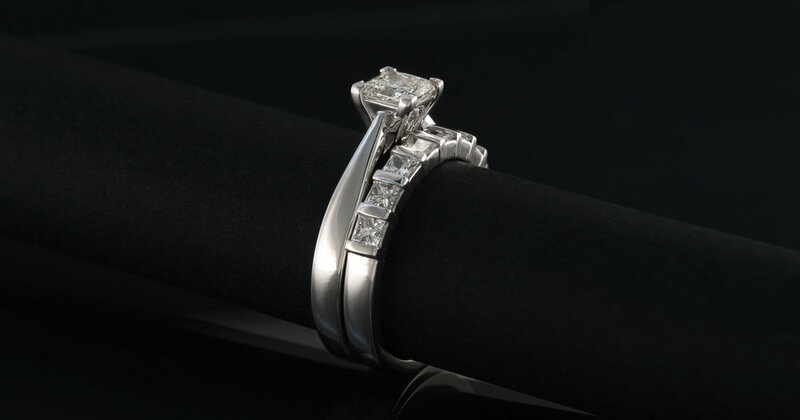 The setting issue with the engagement ring now limited our options even more as we wanted it to be a little higher in profile. It was decided to fix the engagement ring by remaking it. To accommodate the wedding ring we first moved the base of the setting back in to allow the ring to be worn next to it and pass through. This change is shown in the sketch to the right. Next we needed to address two issues. Firstly the change made the setting look a bit odd. Secondly you can notice how in that photo the diamond is set suspended in the v-claws right on the corners with no support under the diamond. The weakest part of a Princess cut (modified square brilliant cut) diamond is the corners. With all the focus of setting on the very tips of the four corners a heavy blow to the diamond could cause it to chip. Changes to our design on the left. On the left above you can see how narrowing the base of the setting looked much nicer and raising the under rail to add support to the diamonds helps to reduce the risk of damaging the diamond during normal wear. It also balances the now slightly different design better. Top to bottom: wedding, engagement and eternity rings. The rings sitting nicely together. 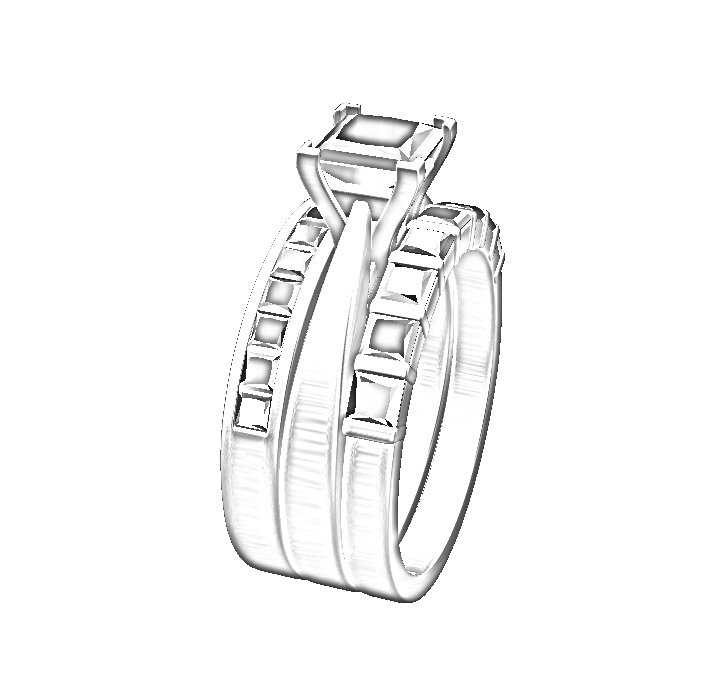 With the engagement ring changes planned it was now time to design the eternity ring. The approved design is shown above. Rather than mirror the wedding ring on the other side for the eternity ring the customer decided to do a bar set design using larger princess diamonds than the wedding ring.